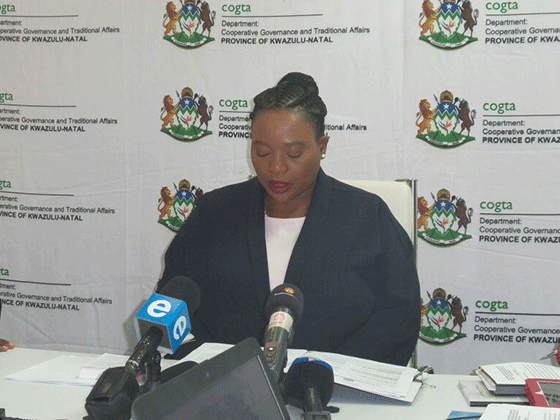 COGTA MEC Nomusa Dube-Ncube is confident plans put in place by her department will help stabilise the troubled Msunduzi Local Municipality. Msunduzi was placed under administration this week following allegations of mismanagement and fraud. Dube-Ncube addressed concerned residents at the KwaCaluza Community Hall on Friday afternoon. She shared with residents what is being done to rectify the situation. The MEC asked for communities to be patient as they try and restore Msunduzi’s reputation. She says a lower headcount could be on the cards. "The municipality will have to reduce the number of its employees as they are above what it can afford to pay for their salaries", she said. "For this reason if the municipality has more salaries to pay, less funds will be allocated for services meant the community", Dube-Ncube said.